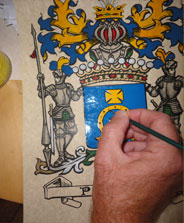 Your family coat-of-arms gets the royal treatment hand-painted on large premium parchment paper and framed. Ships FREE in US. Celebrate the joining of two family names with name histories and a double hand-painted coat-of-arms in three premium frames. Ships FREE within US. Celebrate the union of two family names with their hand-painted family coat-of-arms side-by-side. Ships FREE in US. The joining of two family names side-by-side, with hand-painted coat-of-arms [Framed: 16"h x 22"w]. Ships FREE in US. 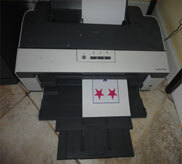 Your family coat-of-arms gets the royal treatment hand-painted on large premium parchment paper (unframed). Ships FREE in US. 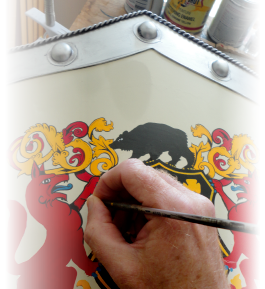 Family coat-of-arms is hand-painted on Celtic designed premium parchment, with custom framing. Ships FREE to US. Family coat-of-arms is hand-painted on Celtic designed premium parchment [unframed]. Ships FREE in US. Hand-painted Canvas, art gallery quality, with a museum feel. Ships FREE to US. The joining of two family names side-by-side, with hand-painted coat-of-arms [11"h x 14"w]. Ships FREE in US. A fine hand-painted Hip Flask, hand-painted with the Coat Of Arms of your choice.